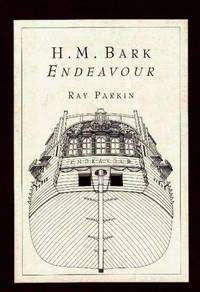 H. M. Bark Endeavour: Her Place In Australian History; Two Volumes. Melbourne: Miegunyah Press (MUP). 1999. With plans, charts and illustrations by the author. 3rd impression (with revisions). Large 4to. Text volume (cloth) and box of plans/charts, in cloth-covered slipcase with title sheet and blurb on front & back. 468pp, 25 maps, 31 full- and half-page ship drawings, and many others (some based on Parkinson's drawings, two of which are also reproduced). The cloth-covered folding case contains 15 detailed ship drawings and plans (800x580mm). The spines a trifle sunned, otherwise fine. .
Melbourne: Miegunyah Press. 1999. Two volumes in slipcase, quarto. First volume text, b&w illus, pp xi, 467. Second volume contains a folding case with fifteen large folding drawings and plans, complete and in fine condition. Fine in near fine slipcase. Captain Cook's ship the Endeavour and his voyage along the Australian coast. With very detailed plans of the ship. Revised Edition. Boards. Melbourne: Miegunyah Press. 2003. Quarto., cloth boards, dustjacket, pp.xi, 467, maps, tables and plans. Fine condition in very good dustjacket. Captain Cook's ship the Endeavour and the voyage along the coast of New Holland (Australia) in 1770. A detailed study of the ship. 2nd Edition. Boards.